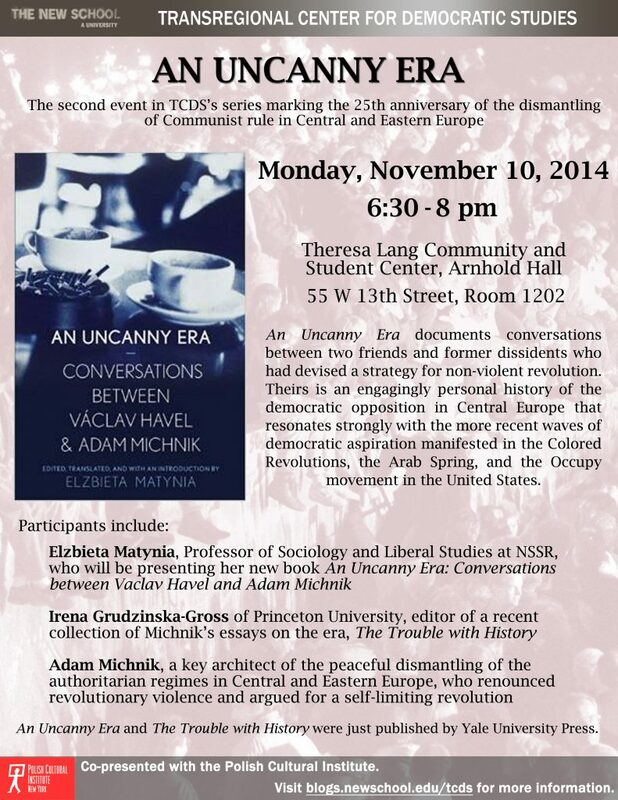 Next in the series of events hosted by TCDS to mark the 25th anniversary of the dismantling of Communist rule in Central and Eastern Europe, will be the launch of two books and a three-way discussion between Elzbieta Matynia, Professor of Sociology and Liberal Studies at NSSR, who will be presenting her new book An Uncanny Era: Conversations between Vaclav Havel and Adam Michnik; Irena Grudzinska-Gross of Princeton University, editor of a recent collection of Michnik’s essays on the era, The Trouble with History; and Adam Michnik himself, a key architect of the peaceful dismantling of the authoritarian regimes in Central and Eastern Europe, who renounced revolutionary violence and argued for a self-limiting revolution. Twenty-five years after the collapse of the Berlin Wall, An Uncanny Era documents conversations over that period between Vaclav Havel and Adam Michnik, two friends and former dissidents who had devised a strategy for non-violent revolution. Before the collapse of Communism both had been political prisoners — Havel, a playwright whose plays were banned and Michnik, an unemployed historian – and thereafter both assumed positions of high responsibility in their respective countries. Havel became President of Czechoslovakia and later the Czech Republic, and Poland’s Michnik, editor-in-chief of the largest, most respected daily in the region. In An Uncanny Era, while citing its many disenchantments, they help to re-focus our thinking about the ways in which radical social change can be accomplished. Theirs is an engagingly personal history of the democratic opposition in Central Europe that resonates strongly with the more recent waves of democratic aspiration manifested in the Colored Revolutions, the Arab Spring, and the Occupy movement in the United States. Both An Uncanny Era and The Trouble with History were just published by Yale University Press (2014). Adam Michnik is an historian, distinguished author and political thinker, and Editor-in-Chief of Gazeta Wyborcza, Poland’s first post-communist and most widely circulated daily. A student activist imprisoned in March 1968, he was a co-founder of the Committee in Defense of Workers (KOR) in 1976, a leader of the Solidarity movement in 1980-81, and a key figure in the Roundtable Talks between Solidarity and the Communist government, in which a peaceful transition to democracy was negotiated in the spring of 1989. A recipient of major European awards, his books include Letters from Prison and Other Essays (California University Press, 1985), The Church and the Left (1992), Letters from Freedom (California University Press 1998), and a dozen others translated into over 20 languages. Michnik holds an honorary doctorate from the New School (1984). A long-time friend and collaborator of the New School’s Transregional Center for Democratic Studies, he was a frequent guest speaker at our Democracy & Diversity Institutes, at numerous TCDS conferences, and was NSSR Visiting Professor in 1997 and 2003.